By now everyone knows that Bobby is a Super Star and that his show is a hit :) That's why he decided to have his mega popular Fashion Show every weekday. If you want to participate, you have to be prepared to dress up quickly. If your closet isn't full of various clothes already, stock up on Shills and/or Super Shills beforehand. Bobby sets the new theme at the beginning of each show, so don't be late. 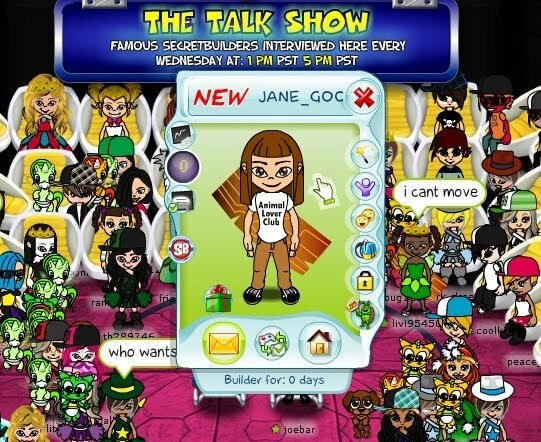 Be there Monday to Friday, at 4 p.m. SecretBuilders Time (PST) and you could win amazing prizes. Today is not just any day - it is a Wednesday! As in Talk Show Wednesday! Yeah, Bobby is a star, but you bet that Joebar is one too! Joebar's Talk Show had 100+ people in the audience for each show today! Congrats, Joebar! Now your show is officially a hit too!!! His guest today was Dame Jane Goodall, who spent her life exploring chimpanzees and fighting for their rights. Did you know that she's a female knight? That's where the "Dame" comes from. Cool, huh? I hope you were able to attend at least one of the two shows - they were sooo interesting! Well, that's my report for today. I hope you didn't miss those shows, but if you did - write them down on your calendar for next week.